How many taxpayers are there really? 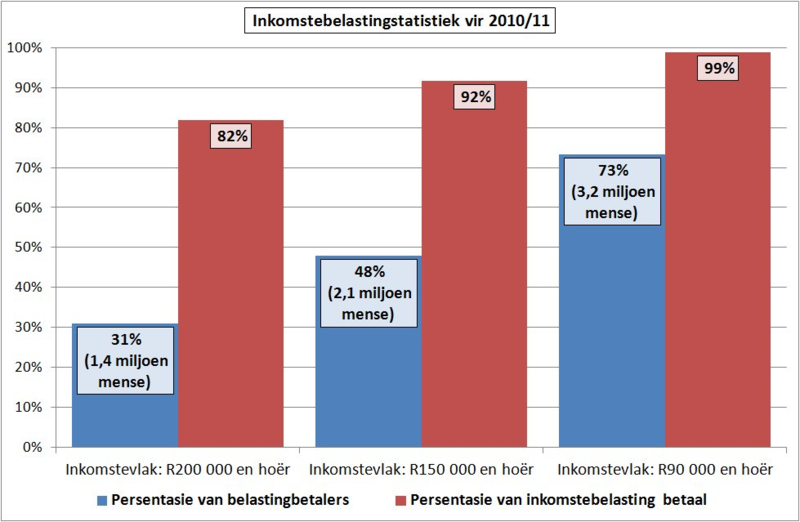 In many a discussion and article about the tax burden in South Africa, figures are bandied about regarding the actual number of taxpayers in the country. The most popular figure seems to be “five million”, but is it accurate? In order to determine the number of actual taxpayers in South Africa, certain issues have to be placed in context first. In the 2010/11 tax year, the most recent year for which figures are available, personal income tax represented just 33,7% of the state’s tax revenue. Company tax made accounted for 19,7%, value-added tax (VAT) for 27% and taxes like the fuel levy and import tariffs made up the remaining 19,6% of tax revenue. However, it is important to bear in mind that the people who pay income tax are also, to a large extent, responsible for paying the other types of tax. Company tax is by no means a tax on companies – it’s a tax on the owners of companies. Company owners are individuals – shareholders – who are, to a great extent, also the people who pay income tax. The same goes for other taxes like import tariffs and fuel levies. The people who buy the products that are subject to these taxes are also largely the ones who pay income tax. With respect to VAT, the tax burden probably leans somewhat more heavily towards people who don’t earn enough to pay income tax, but not as much as might be expected, in view of the low buying power of people with low incomes. Moreover, numerous basic foodstuffs are not subjected to VAT. Low-income individuals spend a large portion of their income on zero-rated products – which is precisely why these products are zero-rated. It is not possible to do exact calculations, but it can be accepted on the strength of the abovementioned reasons that the same people who are responsible for 33,7% of the state’s tax revenue by paying income tax are the main contributors in respect of other taxes as well. In other words: There is a direct and positive correlation between the amount of personal income tax and the amount of other tax a person pays. For this reason, it is a worthwhile exercise to investigate how many people are responsible for paying income tax. In analysing the latest income tax statistics, the first figure that stands out is the 5,9 million registered taxpayers. In 2008, this figure was approximately 5,2 million, which is the likely source of the popular “five million” figure. Those people who have been referring to “five million taxpayers” up to now should therefore actually adjust the figure to six million. However, this figure still does not accurately reflect the number of taxpayers. Just because someone is registered for income tax does not automatically mean that he or she actually paid income tax in a specific year. In 2010/11, approximately 4,7 million people had to submit tax returns. Therefore, approximately 1,2 million registered taxpayers can be ruled out when considering the number of people who really pay income tax. The South African Revenue Service (SARS) has already finalised the tax assessments of about 4,3 million of the 4,7 million people who submitted returns and must still finalise 8,4% of the assessments. The following figures only relate to the 4,3 million taxpayers whose assessments have already been finalised, as comprehensive data is only available for these cases. To begin with, 0,24 million can be deducted from these 4,3 million people, as they didn’t have any taxable income in the period in question. This leaves 4,0 million potential taxpayers. 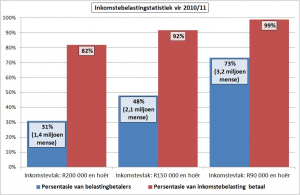 Of these four million people, approximately 1,1 million had an income of between R1 and R90 000 in the tax year. This quarter of the taxpayers contributed only 1,1% of the total income tax for the year – on average just 3,1% of their taxable income. These 1,1 million people can hardly be called taxpayers. If all of them had been exempted from income tax, the effect on state revenue would have been barely noticeable. Consequently, we are left with approximately 2,9 million people who paid close to 99% of all income tax. Included in this group of 2,9 million people is another group of approximately one million people in the income groups ranging from R90 000 to R150 000, who jointly contributed an additional 7,2% of income tax. An average of almost 10% of their income went towards income tax. It would be somewhat inaccurate and ungrateful to not regard this group as “taxpayers”, as 10% of one’s income is not insignificant. However, for the purpose of this article it is meaningful to exclude this group of a million people from the total. The remainder of taxpayers, 1,9 million of them, were therefore responsible for approximately 92% of all income tax collected in 2010/11. This group of 1,9 million people can be further reduced in size by excluding people who earned between R150 000 and R200 000, leaving 1,25 million people who were responsible for close to 82% of all income tax collected. Technically speaking, one could go further by deducting a number of public servants from the totals, but doing so would require a subjective assessment of the value that public servants actually add, which falls outside the scope of this article. Seeing that the abovementioned figures are purely based on the 4,3 million people whose tax assessments have already been concluded, the figures must be adjusted in order to make provision for the entire group of 4,7 million taxpayers who had to submit tax returns. In other words, the 0,5 million people who had to submit returns, but whose assessments have not been finalised yet, must be grouped somewhere. Comparisons of historical figures show that the majority of these people generally fall in the lower income categories. However, in making this adjustment, the benefit of the doubt is given to those in the lower categories and the 0,5 million people are proportionally divided among all the income categories. That is to say, all the groups’ totals are increased by 9,2%. Therefore, based on this adjustment, approximately 3,2 million people were responsible for payment of 99% of all income tax in 2010/11. Approximately 2,1 million people paid 92% of all income tax and 1,4 million people, adjusted from 1,25 million, paid 82% of all income tax. Therefore, there is a greater imbalance between the number of people who pay tax and the total population than is evident at first glance. In fact, South Africa has only approximately 3,2 million taxpayers and, strictly speaking, only 2,1 million or 1,4 million who pay truly significant amounts of tax. Concerned citizens who claim that there are only five million taxpayers in South Africa are incorrect, but the real figures give even greater cause for concern. Interesting, I wonder how many of the 3.2 million people paying 99% of the taxes are working for the state? A real portion of tax revenues are used to pay the salaries of state officials. So when a state employee pays taxes is he/she not basically refunding a portion of the funds obtained from the ‘real’ tax payer revenues. So, we probably have less than 3.2 Million real tax payers. I believe the chaps at Solidarity have already factored out state employees. With state employees the figure rises to about 4.5 million ‘taxpayers’. @GV: My apologies, you are correct. The author hadn’t factored out state employees. This group is obviously not true taxpayers. Rough estimate for state employees I think is around 1.3 million(?). Assuming they all file tax returns (?) and can be grouped in equal proportion to the various income bands reported in the article, they make up 28% of all tax returns submitted and therefore the 1.4 million who pay 82% of all income tax may actually be more like 1.0 million. Unfortunately ‘value added’ complicates the equation. While state employees add zero value, we cannot be sure that all ‘private sector’ taxpayers add true value as they too might be providing the state with goods and services and being paid out of recycled tax rands. I would guess that once this is factored out there are probably a few hundred thousand people paying tax out of genuine value added income. Not really a very positive picture then. An article tracing the increases or decreases in the amount of value adding tax payers, say over the past 10 – 15 years, might also help us to understand the issue more, I think. These calculations show again how false is the constant vilification of what some call capitalists. These entrepreneurs and industrialists are the backbone of the country and the source of every social grant.They also value knowledge, intelligence and skill above ideology. Why do we chase them away? Worse still- the taxes they pay are eroded by corruption and expended on mirages or unimplemented projects. Is this what democracy is really intended to achieve? No mention of the fact that whites are paying the vast majority of taxes and blacks are receiving most of government spending. After all, who would notice such a thing? If blacks had not been oppressed after slavery ended. If they had been given the same opportunities as whites, that would not be happening today. On situations as this society will, whether at the beginning or end, always end up paying. The US chose to pay at the end.